SShhhh..... you're about to learn one of Southern Maryland's best kept secrets. 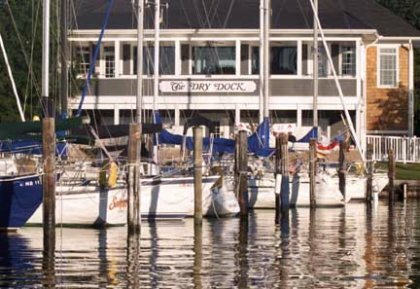 Calvert County's Solomon's Island is well known for its waterfront restaurants, local craft shops and unique nightspots. What you may not know is that the best of Solomon's is right on the way to the more trendy spots. Zahniser's Dry Dock Restaurant is, in this reporter's opinion, the best of the best. Take a little left hand turn before you get on the island and you've discovered a culinary paradise. The restaurant itself is noteworthy by being nautical, casual, romantic and consistently spectacular. Under the management of twenty-year veteran Kathy O'Rourke, this restaurant manages to combine unique dishes, fantastic service, and an ever-changing wine list that will satisfy any palate and price range. She has managed to capture the essence of what a truly intimate restaurant should be. The menu is always a mixture of beef and chicken entrees along with the traditional seafood dishes that we "Marylanders" love. But don't expect brown paper on the tables or crabshells on the floor. This restaurant is all class. They combine Southern Maryland comfort with Georgetown flair. Come in off your boat in shorts or dress up and make a night out of it. But either way, plan on a treat. The menu is changed daily to accommodate their influx of fresh seafood. The chef is creative, unique and generous. A definite cross between Southern Maryland style cooking and California cuisine, but with larger portions so that you never leave hungry. The eclectic staff of servers will always entertain you, and one of the nicest things about this restaurant is seeing the same faces every time you walk in. They truly make you feel like you're coming home to dinner. Years from now after you've turned all of your friends on to the Dry Dock, remember it was you. Someone else will definitely want to take the credit and say,"Hey, I knew about it first!"